1. Listen and mark (rising intonation), (falling questions) or (fall-rise intonation) on the questions in B’s responses. Nghe và đánh dấu (tăng ngữ điệu), (giảm ngữ điệu) hoặc (ngữ điệu tăng-giảm) đối với câu hỏi trong câu trả lời của B. 1. A: What a beautiful day! B: Yes. It’s sunny, isn’t it? B: Let’s go to the concert, shall we? 3. A: He failed the exam! 4. 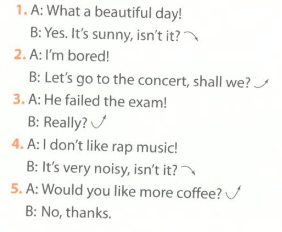 A: I don’t like rap music! B: It’s very noisy, isn’t it? 5. A: Would you like more coffee? 2. Complete the sentences with the words or phrases in the box. Hoàn thành các câu với các từ hoặc cụm từ trong hộp. In general, women have a higher _________than men. Brown rice is more ________ than white rice. The plant is used as a natural ________ for a baby’s teething pain. 3. Rewrite the sentences in reported speech, using the reporting verbs in brackets. Peter invited Mary to go to the party with him. Nam reminded Nga to turn off the lights before leaving home. Paul suggested going to the cinema. John promised not to spend his days mindlessly surfing the Internet. Tom apologised for being late. 4 Choose the best answer to complete each sentence by circling A, B, C, or D.
1. It’s very hot! Let’s go swimming, _________ ? 2. I think you’ve seen this picture before, _________? 3. If you freeze water, it _________into ice. 4. Tom promised_________ private calls on the office phone. 5. He admitted _________ to turn off the electric cooker. 6. The dietitian explained that if people _________a diet high in cholesterol, they are at risk of developing heart problems. 7. The talk show host asked his guest what she _________ if she were a milliona re. 8. She said if I asked her, she _________ me her bike. 5 Read and complete the text with the words from the box. Đọc và hoàn thành văn bản với các từ trong hộp. There is nothing new in the use of herbs and spices. They have existed for thousands of years providing both comfort and luxury. They have flavoured our food, treated (1)_______ and surrounded us with sweet scents. They have also played an important role in our folklore and religious rituals. Many (2)_______ were already known to the ancient Greeks and Egyptians and to people living in ancient times. Records show that our ancestors have been taking advantage of their medicinal properties for thousands of years. Scholars were interested in plant medicine, cosmetics, cooking, and history. The father of Western (3)_______ , Hippocrates, described more than 300 (4) _______ , including a variety of herbs and spices. For thousands of years, different cultures have used them for medicinal and food purposes. The knowledge of their properties continued to develop as civilisation and medical (5)_______ progressed. There are herbs and spices such as black pepper, turmeric, and oregano that can (6)_______ your immune system. Others can reduce inflammation and help to treat infectious conditions due to their (7)_______ properties. These include peppermint, nutmeg and ginger. Studies also show that some spices have (8) _______ potential. For example, in India where turmeric is used, some cancers are rare compared to the USA. Although doctors are not going to start writing prescriptions for herbs and spices anytime soon, it is worth adding them to your food and enjoying the special flavours and their health benefits. 6 Read the text and answer the questions. Future City Glasgow in the UK is an ambitious programme. Intelligent Street Lighting will be trialled in the pilot projects for the future city. It will demonstrate how technology can make life in the city smarter, safer, and more sustainable. According to the programme, energy efficient LED lamps will be installed. This will show how the city can use these lamps to carbon emissions, cut power consumption, and increase safety. Sensors will also be installed on lighting columns. These devices will collect data such as footfall, air and noise pollution levels. This information will feed into the Open Data Platform which, in turn, will make it available to the public. The system of smart lights will be programmed to increase in brightness if the noise level rises, for example, if there is a disturbance in the city. The pilot project will integrate with the City Operations Centre, which helps staff to monitor the new network of modern cameras to zoom in on any problems. The LED system will be operated remotely from the Operations Centre. This could allow for increased lighting if there was an event in the area like a concert or street festival. Intuitive street lights will also be installed on the city’s cycle routes. These tracks for cyclists are mostly unlit. The lights will operate at low brightness rising to maximum when they sense an approaching cyclist. This will help to increase safety in the area and give people more confidence to use the routes after dark. What will be trialled in the pilot projects for Future City Glasgow in the UK? What will the benefits of installing LED lamps be? Why will sensors be attached to lighting columns? What will happen to the system of smart lights if the noise level rises? How will the street lights on the city’s cycle routes operate? Reducing carbon emissions, cutting power consumption and increasing safety. Because they will collect data such as footfall, air and noise pollution levels, and this information will feed into the Open Data Platform which, in turn, will make it available to the public. The programmed system of smart lights will increase in brightness. The lights will operate at low brightness rising to maximum when they sense an approaching cyclist. This will help increase safety in the area and give people more confidence to use the routes after dark. 7 Listen to the recording and decide whether the following statements are true (T), false (F), or not given (NG). Tick the correct boxes. Nghe bản ghi âm và quyết định xem các câu sau đây là đúng (T), sai (F), hay không xác định (NG). Đánh dấu đúng ô. According to health research, too much animal fat is bad for people’s health. In America, people have low rates of heart disease and cancer. In general, the Japanese live longer than all other nationalities. Even in areas where hamburgers, ice cream, and other fatty foods are popular, very few Japanese people develop heart disease or cancer. Doctors advise people to eat more apples, water melons, and less beef and fish. According to medical research, too much animal fat is bad for our health. For example, American people eat a lot of meat, but they eat only a small amount of grains, fruit and vegetables. Because of their diet, the Americans have high rates of heart disease and cancer. In contrast, people in Japan eat large amount of grains and very little meat. They also have very low rates of heart disease and cancer. The fact is that Japanese people live longer than anyone else in the world. However, when they move to the United States, rates of heart disease and cancer increase as their diet changes. When hamburgers, ice cream, and other fatty foods become popular in certain communities in Japan, rates of heart disease and cancer go up there as well. Today, many people in other countries are also eating more meat and dairy products. This could explain why rates of heart disease in these countries are increasing along with the changes in diet. That is why doctors advise that people should eat more grains and vegetables and eat less meat and dairy products. 8 Write about what people should do to stay healthy. Use the following prompts or your own ideas. Viết về những gì mọi người nên làm để giữ sức khỏe. Sử dụng lời nhắc dưới đây hoặc ý tưởng của bạn. There are several ways for people to stay healthy. These include heathy eating, getting enough exercise, and reducing stress. We all know why it is necessary to eat well and regularly. Having three nutritious meals a day and taking time to eat slowly and digest your food properly is important.This means trying to have a balanced diet including protein such as fish, meat, eggs, fiber-rich foods like grains, beans, and lentils, calcium from milk and other dairy products, vitamins and minerals. It should also include a lot of fruit and vegetables for breakfast, lunch and dinner. It is sometimes difficult to find time to exercise every day, but even a few days a week of physical exercise can make us feel better and boost the body’s immune system. To improve heart and lung health, we should also go running or swimming and play outdoor sports like footba volleyball, and tennis. The benefits of a healthy diet and regular exercise will be bigger if combined with spending time relaxing and doing something enjoyable. We can reduce stress by walking, or practising yoga, and meditation. It is also necessary to understand what is causing stress. If we have too many things to do, it is best to make a list, and then to organise them according to their importance. Taking control of your life and planning property are the best ways to lower anxiety levels and reduce stress.